The Machine in the Garden is an interactive videodisk installation dealing with gambling and spirituality, twin distillates of our obsession with luck and fortune, weighing the apparently random outcome of phenomenon against a possible underlying order. Einstein’s Theory of Relativity eliminated Newton’s illusion of absolute space and time, and the combined research of quantum mechanics and chaos theory have shown the flaws in the belief that reality is predictable. As inevitably as we turn to organized religion for reassurance in the face of our mortality, and countless other systems of spiritual belief for their promises of miracles, we are drawn to games of risk and chance. Reconciling spirituality with our apparently reckless attitude toward technology becomes less problematic when we acknowledge that they are opposite sides of the same coin. Playing the odds and betting to win is a decidedly postmodern response to a failing faith in technological utopianism. Modeled on the design of a casino slot machine, The Machine in the Garden incorporates the Buddhist motif of “See no evil, Hear no evil, Speak no evil,” as the final image upon which each video display comes to rest.When the viewer approaches the installation they see, on three video displays, the same woman’s face with hands covering her eyes, ears, or mouth. Pulling the slot machine lever to activate the installation, video from three thematic areas begins to scroll: imagery of war and destruction on one video display; talking heads of politicians, game show hosts, and religious figures on the second; and children’s’ programming and television commercials on the third. Simulating the action of a casino slot machine, the scrolling of the imagery gradually builds in speed, stopping suddenly in staggered sequence, on one of nine possible combinations of the woman’s face. The use of recycled broadcast imagery in this installation represents an interest in the reinterpretation and juxtaposition of images and themes that recur in mass media and popular culture. 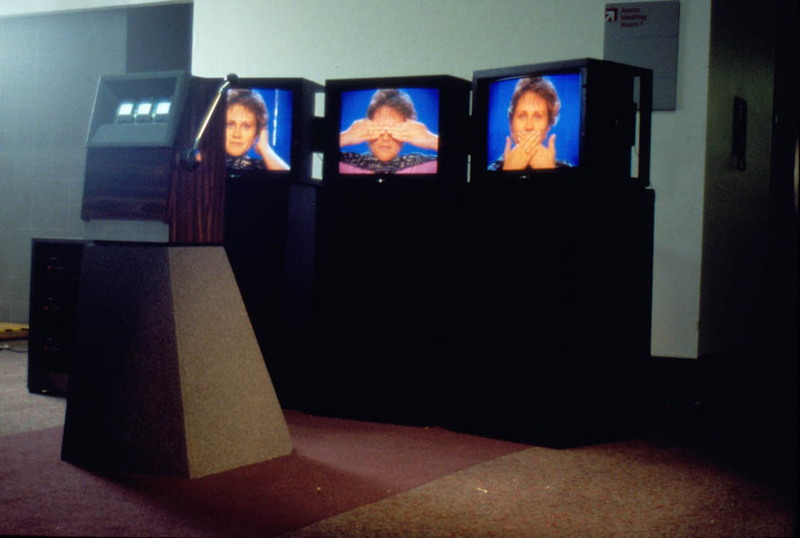 This technique has been employed in a series of installations incorporating technology from the 1950s, with the theme: women and technology, and the manipulation of the body through representation. This series of installations provides a framework of irony and empowerment for the presentation of complex issues and images, particularly as they relate to women. These installations counter the optimism and passive acceptance that women are expected to feel toward technology with the real impact it has had on their lives. The juxtaposition of old and new technology draws the viewer into an examination of popular culture in relation to the current ‘revolution’ in micro-electronics.